Hello Bloggers, family, and friends! My name is Marie and I grew up in sunny San Diego, California. I recently graduated Loyola Marymount University in May of 2010 and am moving to Seoul, South Korea to begin teaching English! I hope through this introduction you will get to know more about me. I love to write, so if you love to read, or I have not skyped you for a while this blog is for you! Many of my friends and family members think I am nuts for moving (I am a classic California beach girl) but I love to travel and fell in love with Korea last summer. 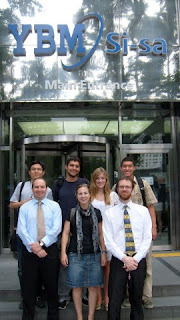 The Father P. Daly Scholarship for summer study in Korea provided me with a 2 week grand tour of Korea. The time I spent there during July of 2009 impacted me so much that in April of 2010 I decided to apply for a job teaching English to adults. I am set to begin teaching sometime between July and August with my visa paperwork pending (I will go into a detailed post about this later). The process of receiving a job was very easy for me because during my 2 week stay I toured YBM, one of the largest private English companies in Korea. I simply applied online, and then pulled out one of the academic directors cards who I had lunch with last summer and sent him an e-mail. I made sure to attach a picture of me and the director, and with a little old fashioned sucking up, and a great recommendation I was hired within a week. There is no better way for you to get to know me than by reading an article I published in my college newspaper about the scholarship I received in Korea. I was an Entertainment and Arts Editor for two years and this was my first article for the Opinion Section! So here it is! One day over the 2008-09 winter break, my mom blurted out something on the subject of two Korean teachers coming to live in my bedroom – in other words, we were going to be a host family. After realizing that she was serious, the first thought that came to my mind was that she was on drugs. Since when did my parents decide to let complete strangers move into my house temporarily, and let alone into my room? Little did I know, these two teachers would change my life forever. My values, opinions and beliefs about Asia changed drastically over their two-week stay. I found myself obsessed with their culture and wanting to learn more. Luckily, while working on the A&E section of the Loyolan after that break, I stumbled across an ad for the Fr. John P. Daly Summer Scholarship for Study in Korea. The application deadline for this year is approaching in just one week, and, as a past recipient of the scholarship, it is about time to spread the word about the most amazing experience of my life. Throughout my two-week stay in Seoul, South Korea, my group of four LMU students was given a grand tour by six Sogang University students. From the moment I stepped off the plane and met my tour guides in the airport, there was a sense of community. My tour guides Lee Kyung-Suh and Ho-young spent every second of the day and night with me, unless members from my host family were there. The itinerary for the trip was demanding, but rewarding. Even my tour guides had not been to some of the places on the list and were genuinely excited. Our guides and host siblings were eager to get to know more about America. Several of them were American culture majors and loved our “That’s what she said” jokes, even though it took them three days to figure out what those meant. There were no major language barriers. That is, except for the fact that “no” means “yes” in Korean and “yes” means “no.” Hearing the phrase “No, no, I mean yes, yes” became less confusing over the course of my stay. Most Koreans are well versed in English. In fact, most students start learning at a young age and continue throughout high school and college. One of the most thrilling experiences was the trip to Pan Mun Jom Truce Village and the Joint Security Area (JSA). Just weeks before traveling to Seoul, the political tension was high due to North Korea’s reinstated uranium enrichment program. Many of my friends and family members were seriously concerned for my well-being thinking a war might start during my stay. All of this worry was immediately put to rest after arriving in Korea. In fact, most of the younger generation doesn’t care enough about North Korea to even talk about it. My host family’s daughter, Summer Choi, explained that my family’s fear was only due to the exaggeration of the American media. For me, gazing over at a North Korean soldier and standing on the northern side of the Military Demarcation Line was something words cannot explain. Even though we were constantly eating an insane amount of food, I returned home five pounds lighter from all of the walking. If you think the subway system in London is amazing, the subway in Seoul will seem like the Ritz Carlton. Upon returning home, there was a piece of my soul missing. I was constantly trying to get Korean BBQ and traveled to Asian grocery stores to find Soju and Hite. In Korea, drinking is not to be ashamed of; in fact one of my tour guides stated,“In Korea, if we drink, we drink to get drunk.” However, peer pressure and binge drinking is not acceptable, and drinking is usually a time of celebration among friends and family. 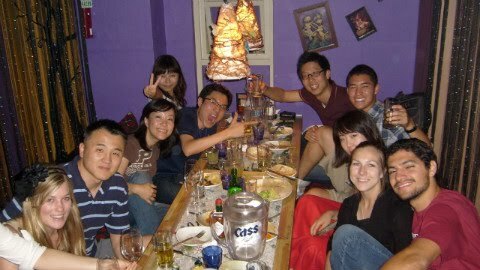 During my group’s final going away party, there were plenty of empty bottles of Soju, Hite, wine and soju-tinis! I never expected that tears would be running down my face while saying goodbye to my tour guides and host family the next day. There is a never-ending list of amazing places and experiences you will have from receiving the Fr. John P. Daly Scholarship. There is no homework or classes required during the trip. The only request is that you return home and write a reflection paper on your experience. The applications are due next Monday. Remember that only four students will be chosen for the scholarship. Any major is eligible to apply. To learn more about the scholarship, stop by the Hilton 200G office or visit their Web site at cba.lmu.edu/cab. This trip will impact your life forever. This is the opinion of Marie Webb, a senior ethnomusicology major from San Diego, Calif. Please send comments to mwebb@theloyolan.com. Hope you enjoyed my first blog ever, there will be many more to come.